Very Good. 0446677469 ALL BOOKS SHIPPED WITHIN 1 DAY OF PURCHASE! Very Good. Trade paperback (US). Glued binding. 384 p. Contains: Illustrations. Rich Dad's (Paperback). In this follow-up to the bestselling "Rich Dad, Poor Dad", Robert Kiyosaki reveals the secret of how the wealthiest people become wealthier by presenting some simple investing secrets and explaining how anyone can enjoy cash benefits merely by knowing where and how best to invest their money. Good. Trade paperback (US). Glued binding. 384 p. Contains: Illustrations. Rich Dad's (Paperback). In this follow-up to the bestselling "Rich Dad, Poor Dad", Robert Kiyosaki reveals the secret of how the wealthiest people become wealthier by presenting some simple investing secrets and explaining how anyone can enjoy cash benefits merely by knowing where and how best to invest their money. 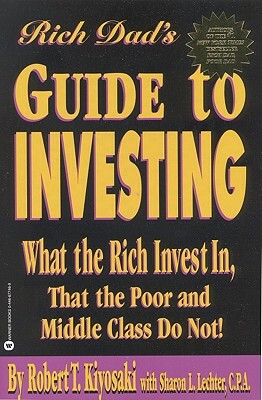 All Editions of Rich Dad's Guide to Investing: What the Rich Invest in That the Poor and Middle Class Do Not!